I am starting this new magazine with a desire to present beautiful original jewelry and accessory designs from all over the world, as well as some tips for online marketing for web shops. Each issue will include a few main features, jewelry and accessories. It will also address beginner tips for making your own jewelry and online shops where you can buy supplies. 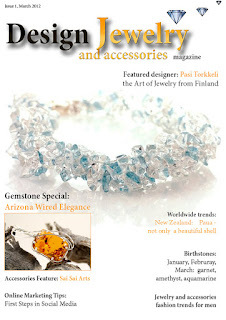 Design Jewelry and Accessories issue #1 features as main designer Pasi Torkkeli, from Finland. On the cover of the first issue you can see the necklace worn by Tarja Turunen (ex Nightwish singer) in the video I Walk Alone. The first issue has a total of 64 pages. Check it out and tell your friends! For a limited time only, the first issue is available for download for 99c! !